Service Design is the activity of planning and implementing change to improve a service’s quality to meet the needs of the users of that service. It is a holistic, customer-centric approach using design principles, tools, processes and an empathetic understanding of customer needs. Whether you are a doctor’s surgery or a local council, service design is a creative and practical way for you to improve and innovate your existing service or help you design new ones. Designing your services based upon how they are experienced from the ‘customer’s perspective.’ Placing the user or consumer in the centre of the service allows us to discover how the patient experiences the service. We do this by implementing a range of techniques including interviews, observations and field research to gather insights into the consumer’s needs, experiences and behaviours. Essentially we are asking the users what they expect from the service, how they feel about using it and whether they would use it again. Deeply and empathetically understanding psychographic and behavioural drivers such as expectations, consumption behaviours, personal tastes, core decision making influences and personal and cultural values and belief mechanisms all help to understand the user. When used wisely, technology can help enormously to enhance the user experience by improving efficiency and personalising information. But we can’t do this if we haven’t evaluated exactly what that user needs and how they behave. All stakeholder groups should be involved in the service design process. Co-creation is the process of involving users not only in the design of the solution but also the production and development of it. Multidisciplinary teams from all levels within your organisation will allow for a range of expertise, knowledge and skills and will generate great ideas. Work out who is within the service ‘ecosystem’ and make sure every party is represented. Getting the input from all of the people involved in the service creates a partnership between the professional groups as well as the consumers, users or patients. Everyone has an opportunity to input their perspectives and experiences. Not only will this create a better service in the long run, it will help to make both those who use the service, and those who provide it, feel valued. Engaging stakeholders in a co-creative process encourages a higher level of consistency, placement and commitment to the customer as the centre of the service philosophy. One of the main features of services design is not avoiding making mistakes but learning from them. This is achieved by prototyping and testing. You can save a large amount of time and money if you test the experience before spending lengthy periods of time developing it. It’s imperative to prototype solutions before you launch them but it is also a good idea to release and test your iterations many times through the process. Don’t just wait until the end of the project to do so. In a collaborative team environment, it is more expressive to use visual aids than to rely purely on words. Get the team to use sketches, pictures, graphs, maps and prototypes where applicable. Be creative with coloured pens and glue. Visual tools can be less complicated to digest and more tangible. They make things easier to remember and can help to properly explain what you’re trying to achieve. The entire environment in which the service exists and is delivered should be considered. Holistic services look at the whole user journey and consider each touch point of that service. Touchpoints refer to any interactions that occur between users and a service. A holistic approach can be achieved by using service blue prints, personas or fictional characters to highlight different user experiences and user journeys. A well-rounded and complete service also involves the functionality, safety and reliability of the service. 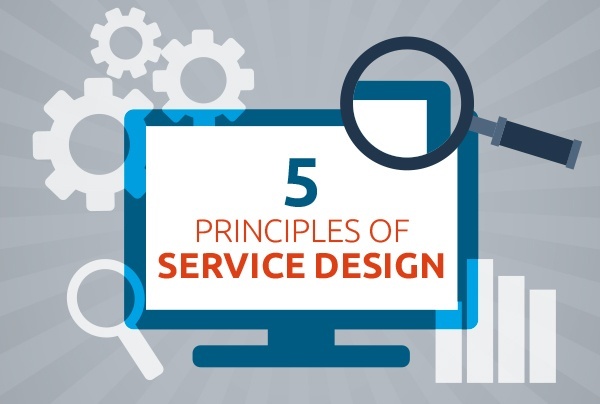 These five principles form the foundation of a successful service design initiative. How to minimise stress on staff and patients through open communication in the waiting area?